← The Sports Archives – Playing In The Mud! The Sports Archives – Tracing The Origins Of The Modern Rugby Boot! When it comes to footwear, the kaleidoscopic range of colours and myriad of shapes that are available to Rugby players today means that you’d be forgiven for thinking that a typical game is as much of a fashion show as a sporting event. While it may be true that modern manufacturers are catering to the scrum-loving fashionistas out there, they are also spending a lot of time and money to develop ever more advanced performance footwear that is carefully designed to improve a player’s level of comfort and stability, reduce injuries and even gather and provide performance data via handy built-in electronic devices. Whilst nobody can deny that modern rugby boots are some pretty fancy bits of kit, you can get a really good picture of how much things have advanced by tracing the development of this highly specialised variety of sports footwear. Rugby football evolved from a tradition going back hundreds of years. The game as it was back then was a much more violent affair, where laws had to be written to specifically prevent players from attaching metallic components to their footwear in order to make their ‘hacking’ inflict maximal damage. Aside from the rules that were written to protect players from vicious shin attacks, there were no real guidelines as to what players could and couldn’t wear on their feet and as such, early competitors would wear whatever they felt most comfortable in. As the sport of Rugby evolved, so too did the equipment which players would wear to improve their game. The first specialist boots were fitted with bars or studs to provide greater traction and increased stability in all weathers, but these features, combined with the heavy weight of the boots, made them cumbersome by today’s standards. Over the years, one of the top priorities of sportswear manufacturers was to make their products more lightweight, without sacrificing on support; something that was easier said than done without today’s high-tech materials. By the latter half of the 20th Century, leather studs would soon be replaced by increasingly lighter, stronger screw-in units fashioned from steel and exotic alloys, heavy leather uppers and the traditional ‘boot’ shape were rendered obsolete by lightweight synthetics and a style which was fine-tuned to the modern game. Today’s rugby boots are filled with technology, along with lighter weight materials and improved ergonomics, each manufacturer strives to produce the ‘ultimate’ boot for today’s discerning players. 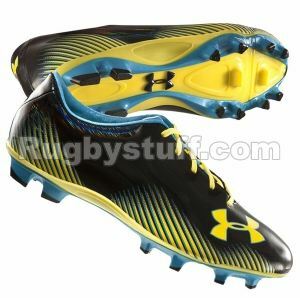 As such, one can only wonder what rugby players of the future will be wearing on their feet! The author of this post frequently writes about everything sportswear-related, from the development of rugby boots to advances in compression gear. This entry was posted in Other and tagged Rugby, Rugby archives, Rugby Blogs, rugby boots, Rugby boots history, rugby cleats, rugby jerseys, rugby memorabillia, rugby shirts, sports and leisure, Sports Archives, Sports Blogs. Bookmark the permalink. 3 Responses to The Sports Archives – Tracing The Origins Of The Modern Rugby Boot!